Note: This article is related to MySQL user's databases server on Windows. Not the Plesk SQL one. Plesk interface should be accessible. The MySQL server is marked in red on the Tools & Settings > Database Servers screen. Plesk stores incorrect MySQL server administrator password. Stop the MySQL server (but not "Plesk SQL Server") from running on port 3306 using the Plesk Services Monitor, that can be started from Windows Start menu. 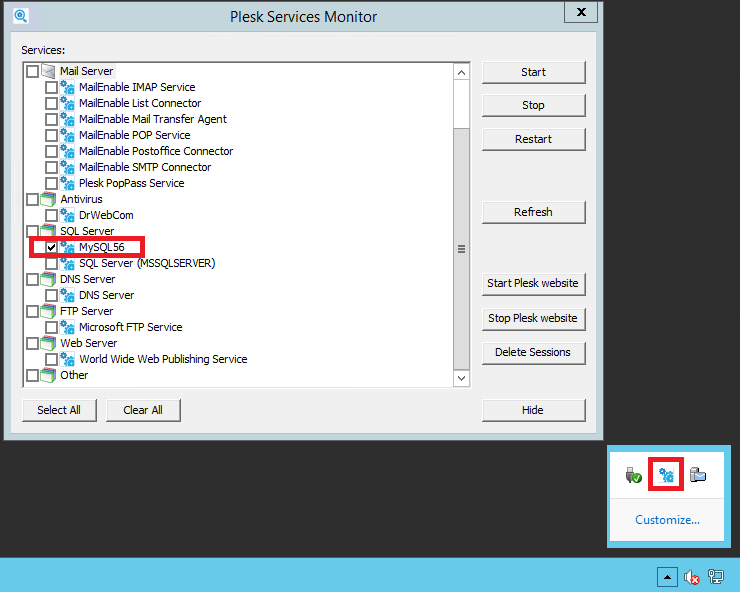 Start the MySQL server using the Plesk Services Monitor. | localhost | local_mysql_root | <--- MySQL administrator was renamed to "local_mysql_root"
Remove skip-grant-tables from the MySQL configuration file and restart the service. Log into the Plesk interface, go to the database server management settings ( Tools & Settings > Database Servers ), and change the password for the corresponding database server to the one set in Step 5. Plesk will re-establish the connection to the server. How to retrieve/reset a password for the "admin" user in Plesk for Linux? Where can I finde the Plesk Services Monitor in LINUX? Thanks I am still having problems.